Celebrate the protection of basic parental rights! JUNE 7, 2017 UPDATE: The deadline for this duo of bills replacing parents to pass the State Senate has come and gone. Celebrate that both SB 18 and its companion resolution, SCR 41, by anti-parent State Senator Richard Pan, Democrat of Sacramento, appear dead for the year due to an outpouring of opposition from concerned parents. Thank you to everyone who called and raised their voice! Both bills were "shelved" by the Senate Rules Committee in April (neither SB 18 or SCR 41 advanced since April). Both bills could come back in 2018. APRIL 10, 2017 UPDATE: Because of phone calls from pro-family Californians, a radical anti-parent bill, SB 18, which even made some Democrat legislators nervous, has been completely gutted. These amendments delete all the new, draconian powers given to the State to dominate parents and even take children away from good parents. Instead, the new SB 18 would create a commission to recommend how the State should eventually replace parents in raising children. Realize what this means. The old SB 18 is dead -- and that's a real victory. But the amended SB 18 is a slow burn that should also be vehemently opposed. Leave easy voicemails for the 5 members of the State Senate Rules Committee. In your message, say: "I'm calling to urge (Senator's name) to OPPOSE THE AMENDED SB 18, which still aims to replace parents with the State. Hands off our kids -- NO on the amended SB 18." Leave voicemails between 7pm and 7am. Do not reveal your name, city, or contact info (if you mistakenly do, they'll likely disregard your call unless you're in their district). "Children's rights"? Realize that every legal right given to a child is a legal right stripped from parents! Homeschooling families, Christian families, parents who discipline, parents who own guns, parents against controversial vaccines -- they're all targeted if the State takes control of children. As originally introduced, under the perfectionist, subjective terminology of SB 18, any parents who aren't doing what's "best," "optimal," "healthy" or "appropriate" in the eyes of the State are now BAD PARENTS whose children (or grandchildren) could be taken away from them. The wording in this first version of SB 18 is broad, vague, and complex. 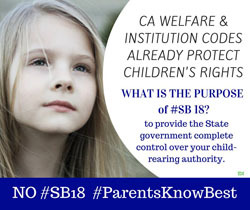 If the introduced version of SB 18 became law in California, it would, at the very least, be a dangerous attack on parents having the legal right to make decisions for their children (ages 17 and younger) in every area of life (e.g., religion, education, social involvement, health, friendships, etc). The state would become the enforcer of these newly created children’s rights (e.g. a heathy and safe environment; social and emotional well-being; an appropriate and quality education; and appropriate and quality health care). It could override the current Constitutional law, which recognizes that parents have a FUNDAMENTAL LEGAL RIGHT to direct the upbringing and education of their children. It could result in violations of families’ FUNDAMENTAL LEGAL RIGHTS to be secure in their homes against unreasonable state intrusion. » Children who have parental support are likely to have better health as adults. » Students with involved parents tend to earn higher grades, have better social skills, and are more likely to graduate and go on to post-secondary education. » Children are more likely to be socially competent and have better communication skills when they have parents who are sensitive to their needs and emotions. » Teens who are monitored by their parents are one-quarter as likely as teens with "hands-off" parents to smoke, drink, and use drugs. "Just like a good personal trainer, we want the robots to be able to guide the child toward a behavior that we desire,” said Brian Scassellati, a computer science professor at Yale and principal investigator for the study. "What we want to do is move these robots out of the laboratory and into schools and homes and clinics, places where we can directly help children on a day-to-day basis," he said. The NSF grant said the project is necessary due to "critical societal problems."